Looks like quite a few people got out this weekend to ride around and get things done! Good job, errandeurs. Errandeur is a French word for people who do errands on their bikes. Kidding! I made it up. Since the Errandonnee was announced, questions have arisen that were not explicitly covered in the rules. This post includes those questions, and even answers them. If you have more questions, feel free to tweet them to me (@gypsybug) or write your question as a comment below this or the original Errandonnee post. Q1. Does mileage count one way? If I’m riding one (or more) errands and then go home, do I count the mileage going home, or do I just count the mileage to the errand(s)? A1. You can actually count both distances toward the 30-mile total. When I was putting it together, I was thinking about average minimum distance round trip. Q2. Would filling up 3 growlers at Chocolate City Brewery count as a “Personal Care” stop if I drink to my health? A2. OK. I’m feeling a little flexible this year so for purposes of this year’s Errandonnee you may count a beer run or even Happy Hour in the Personal Care category. Q3. So if I stop at a bakery 1 mile from home then ride another 20 miles for fun, do I count the other 20 miles? A3. You may count the other 20 miles if you like, too. Some people may have to do bonus miles like this to meet the minimum 30-mile overall distance so it is perfectly allowable. Q4. Does biking back from a camping trip count as errandonneuring? Q6. Why is the bank not included as an errand? A6. You may include a trip to the bank under the Personal Care category. Health-related errands as well as financial-health errands are included this category. Q7. Any bonus for carting children on said errands? A7. No bonus miles, BUT you do receive extra righteousness points and the possibility that your child could qualify as honorable mention! Q8. If several different errands are combined in one trip, how do I break out the mileage for each? For example, total trip = 13 miles, included 3 categories. How do I indicate such on control card? A8. You may put the overall mileage under one errand category, and then reference it under the other errand categories you completed that day. Q9. Can I do all 12 of my errands in one day? A9. Yes, of course, provided you meet all of the other Errandonnee requirements. Q10. Does the observation or thing I learned have to be bike-related? A10. No, but it should relate in some way to your errand. For example, while it might be an important thing to learn about yourself, going to the bike shop and realizing that you will never be a dentist would most likely not meet the criteria of something you learned or observed on a bike shop errand. Q11. What’s this Errandonnee business and how is it different from day-to-day life? A11. It’s no different from day-to-day life for some of us except you get a prize from me for doing it! So you see? You should do it! Q12. I just took my new bike out for a five-mile shakedown ride. Can I count it as a Personal Care errand? A12. Sure. If a beer run counts, then you might as well do one on a finely tuned bike. Q13. I forgot to take a photo during my errand. What can I do? Q13. The photos are really to document your errand. In the event you were unable to take a photo (or forgot), you may try another method– say a receipt or a witness or something, get creative– to evidence your trip, and the Errandonnee Rules Committee will consider it. Q14. I meet up with a couple of bike club leaders for easy, recreational rides, always involving coffee, food, and conversation. I bicycle to the train station, take the train into the city where the club is, bicycle to the meeting point, and then, of course, do the ride.Does this qualify as a coffee, lunch or wild card errand for purposes of this challenge? Q15. Are tea and coffee interchangeable? That is, can a tea-date count in the coffee category? Also, does it have to be at a coffee shop? A15. Yes, tea and coffee are interchangeable. Yes, a tea-date may count in the coffee category. No, a tea- or coffee-date does not have to happen at a coffee shop. It could even be the 7-11 (though I’m pretty sure the drinks would not be that good)! Q16. I’m a school bus driver. I go to work, but come home in the middle of the day and return to work later for the afternoon route- do I count it as two separate Work errands, or one long Work commute for the day? A16. You may count it as two separate errands in the Work category because you are doing two round trips. Q17. Do you REALLY want 12 photos e-mailed to you, or would you like us to post them on our own blog/site and you can check them there? You may also use flickr or Picasa and link me to your photos that way as well. Q18. Can I do a multi-modal errandonnee? For example, can I ride my bike to the train station, take the train to another location, and bike from the train station to wherever my errand is? A18. Yes, you can do a multi-modal errandonnee, but only the miles where you rode your bike count toward the total Errandonnee mileage. Q19. My only question is, pronunciation, when I tell friends what I am doing. Errand-O-nnee or Er-RAND-onnee? A19. I have always pronounced it Er-RAND-onnee, but given that it is a made up word I think the first pronunciation is perfectly fine, too! Q20. Can we submit a Strava map image in lieu of a ride photo? A20. Yes, you can submit a Strava link, although a photo is preferred. Q21. If I bike to where I planned to run an errand, but fail to actually complete the errand, does that still count? In my case, I went to a bike shop only to find that it’s closed all week. A21. Yes, you can still count it, provided you documented it. Q22. Could riding to school count in the work category, or is it more of a Wild Card? A22. Are you a student? If so it counts as work. Q23. Will a bookstore work in lieu of library (if we go for “reading research”), or does that fall under “any store other than grocery store”? A23. Library and book reading. 1. A book store cannot count as library, but as noted, as store that is not the grocery store. Q24. The phrase, “also includes book reading” confuses me — does that mean that riding somewhere to read a book that I already have, could go under the Library heading? A24. I had not considered this interpretation of riding somewhere to read a book one already owns. Yes, it qualifies. I will count it as a “Library Without Walls” library. Q25. Could visiting a friend who’s going through, let’s say, a very tough time, count as “Community Meeting?” Or is the point of that category that more than two people are involved in whatever the event is (and that the purpose of the event is “bigger than”, or “outside”, those two people)? A25. It would not count under Community Meeting. That is intended to be, as you suggest, larger than two people. However, you could count it as a Wild Card, OR if you visited and had lunch or breakfast or something, you could count it in the Breakfast or Lunch category. Q26. Does daughter’s ballet class count as a community meeting? A26. Yes, you may count it as a community meeting. 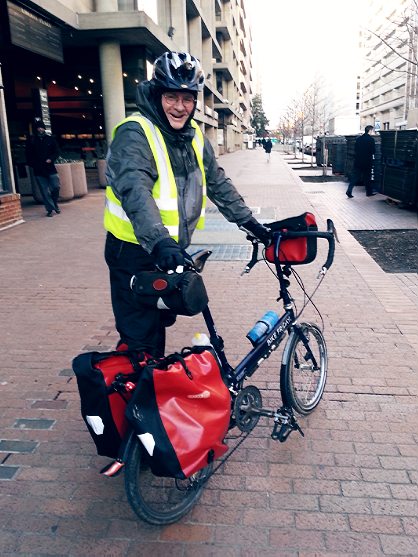 Pingback: Winter Challenge: The Errandonnee | chasing mailboxes d.c.
What if we are riding our bicycle, measuring the air-speed velocity of an unladen swallow? Doesn’t it depend on whether it’s an African or a European swallow? Why? Are you suggesting one would fall under the Personal Care category because it’s getting rather full. Well, we do need a lot of personal care! They call me El Errando Grande!! I wonder… if a beer run can be classified as health care, then… riding to my father’s garage to “steal” a U-lock can be considered as a “Bike Shop” errandonnee? Yes, it can count, provided you are doing the errand for a bike part, like the U-lock. I’m not working but I tutor as a volunteer. Can I count that as work? Exciting stuff! Can’t wait to get on mine. I spent the entire weekend snowshoeing. No bikes there, not even snowbikes! I’m trying to think of a way to make the decision to not be a dentist related to my errands. It would be convoluted, but I’m sure it could work. Most of my observations are currently about snow banks and curb lakes. Do it. I know you can do it, Physics Girl! I’m a school bus driver. I go to work, but come home in the middle of the day and return to work later for the afternoon route- do I count it as two separate Work errands, or one long Work commute for the day? You could count them as two seaparate work commutes. Thanks! Do you REALLY want 12 photos e-mailed to you, or would you like us to post them on our own blog/site and you can check them there? Or do you want us to make them really small …? Good question. You have a variety of options. 1. If you have a blog, you can post them there and send me the links. 2. You may also use flickr or Picasa and link me to your photos that way as well. 3. You can send me the links to your Errandonnee tweets. 4. Finally, I will accept 12 photos via e-mail if that’s what works best for you. Can I count volunteering at my neighborhood bike co-op as community meeting? Or do I have to use bike shop / wild card? I’m blogging my errands. 8 completed s of today! I saw that! Great post and photos. I like the Canada kickstand! Regarding volunteering at the bike shop as Community Meeting, I say ok, as you are going to the shop, meeting with others in the community, and helping the community out. So to be clear…. I can the ride to the ride TO the SPP 5:45 a.m.ride? I am thinking I should be able to count it as personal care since I am so heavy and trying to lose weight. That is BETTER than a trip to the Dr’s.office. Sorry… I guess I should proof read before submitting. What I MEANT to say was… “I can count the ride TO the Rusty Bridge in Severna Park to meet the SPP group for their morning 5:45 ride”? I am a bit late to this but I think I can do it, problem is I live in Australia so my errands are not done in the context of winter riding as its summer here now and the underlying premise of the errandonnee is to get people riding during winter. Is my entry allowable? Yes! Welcome to the Errandonnee! I was thinking of using Google Drive to share my photos with you. It seems less cumbersome than emailing them. Does that work? Pingback: Winter Challenge: The Errandonnee, 2014 Edition! | chasing mailboxes d.c.
Must we keep the control card or is blogging our errand rides good enough? Also — I may need to ask for an extension as I have come down with the crud yesterday (first day of errandonneering) but I may be ok to do this within the current time limit. Will let you know.